A suicide attack on the headquarters of the regional Sahel force, G5 killed two soldiers and a civilian in the Malian town of Savare, June 29. The host of an African Union (AU) summit that opened yesterday warned that a deadly attack against a regional anti-terror force has exposed regional security failings. A suicide bomber in a vehicle painted in U.N. colors killed two soldiers and a civilian in the attack on the headquarters of the so-called G5 Sahel force headquarters in the Malian town of Sevare on Friday. 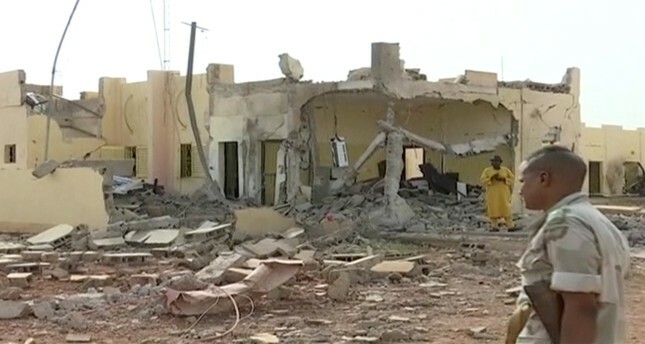 It was the first attack on the headquarters of the five-nation force, which was set up with French backing in 2017 to fight militant insurgents and criminal groups in the vast and unstable Sahel region. Mauritanian President Mohamed Ould Abdel Aziz, whose country is part of the G5 and is hosting the two-day AU summit, said the bombing "hit the heart of the region's security and lashed out at a lack of international help. The Al-Qaeda-linked Support Group for Islam and Muslims claimed the attack in a telephone call to the Mauritanian news agency Al-Akhbar. "It was a message sent by the terrorists at this precise moment when we are getting organized to stabilize and secure our region," Aziz told France 24 television. "If the headquarters was attacked, it is because there are so many failings we need to fix if we want to bring stability to the Sahel." The G5 aims to have a total of 5,000 troops from five nations, Burkina Faso, Chad, Mali, Mauritania and Niger, but has faced funding problems. It operates alongside France's 4,000 troops in the troubled "tri-border" area where Mali, Niger and Burkina Faso meet, and alongside the U.N.'s 12,000-strong MINUSMA peacekeeping operation in Mali. Underscoring the regional insecurity, four Malian soldiers were killed on Saturday when their vehicle drove over a landmine in the central Mopti region. Aziz said the G5 was a "sovereign initiative" of Sahel states that face not only security problems but drought, poverty, unemployment and trafficking. "We are not at all satisfied with the help we are getting. We also feel that the doors of the United Nations are closed." Security was high on the agenda at the AU summit in Nouakchott being attended by more than 40 African heads of state and government as well as French President Emmanuel Macron, who met G5 leaders to focus on progress made by the force. African leaders want to look at a planned ceasefire in South Sudan's civil war and at the detente between Ethiopia and Eritrea, whose relations have been poisoned for decades. Rwandan President Paul Kagame, who holds the presidency of the 55-nation AU, will make a call to promote free trade. Currently, African countries only conduct about 16 percent of their business with each other, the smallest amount of intra-regional trade compared to Latin America, Asia, North America and Europe. Meanwhile, discussing the flow of migrants from Africa to Europe, Aziz told France 24 it was a result of the "destruction" of Libya by Western strikes. "I am not saying that all responsibility lies with Europe, we must deal with the problem upstream," said the former general who took power in a coup in 2008 and has since been elected twice.